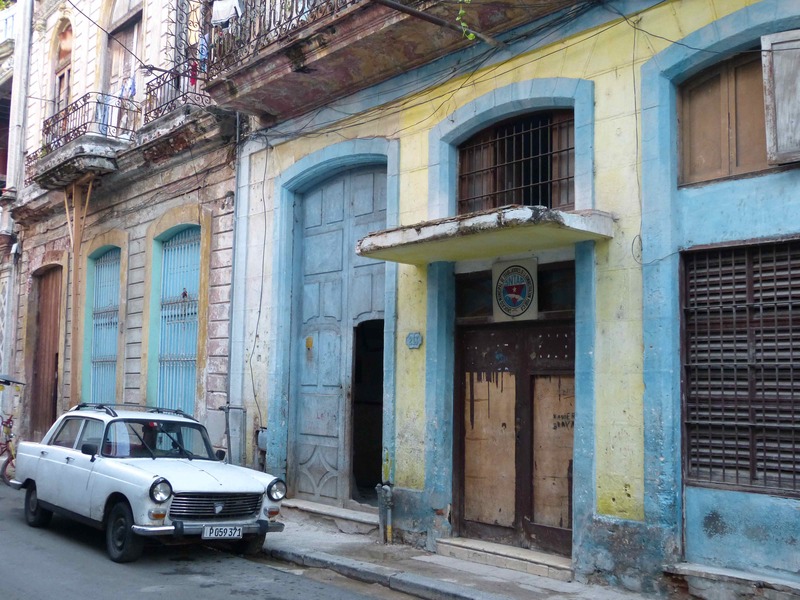 A trip to Cuba is possibly one of the most fascinating travel experiences ever. 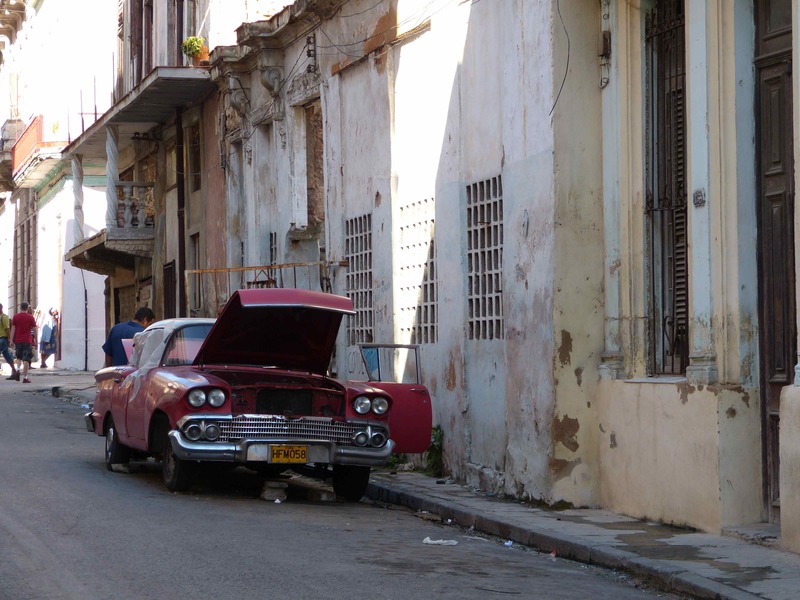 Landing in Havana is like taking a step back in time to the 1950s where everything remains frozen in time yet in various states of decay. 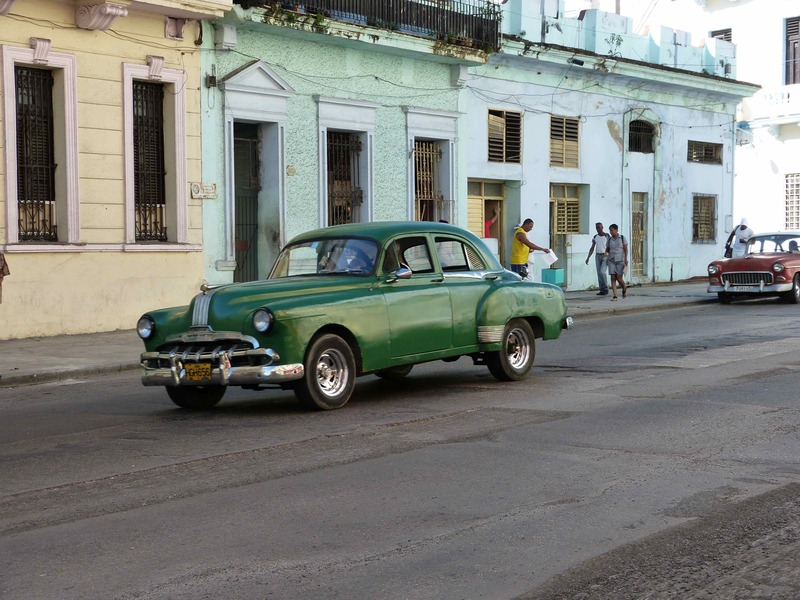 I instantly fell in love with Cuba the moment I got off the chartered plane and saw my first 1950s retro-fitted American car. The history, culture, and people of Cuba are utterly invigorating and Havana has an energy that swept through my veins and left me craving for more. Over the past eight days in Cuba, I took well over 1,200 photos and 50 pages of notes on all the various historical, cultural and social facts about this unique country. 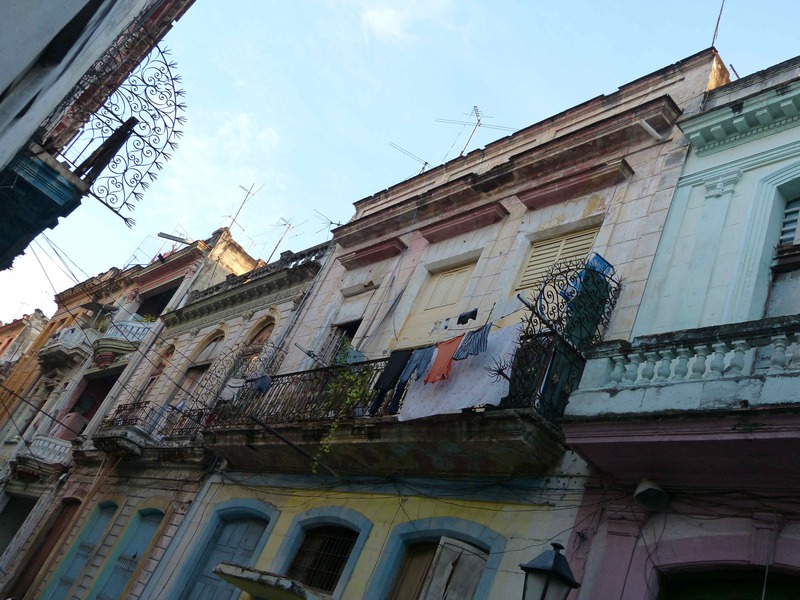 I learned a great deal and am so excited to share my insight into Cuba over the next several months on my blog. 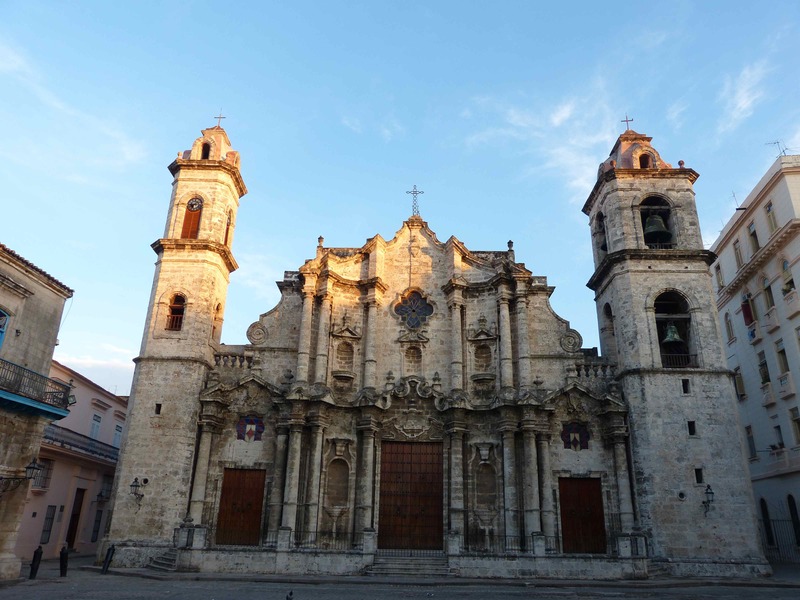 As an American being required to enter Cuba on a special visa for a “people-to-people” trip (one of the only ways Americans can enter legally as a tourist) allowed me to gain firsthand knowledge and insight into the ins and outs of Cuban life, history and culture. Although I’d rather travel there freely, being on such a tour felt like taking a university class. I learned so incredibly much in so little time. It will take me a few days to unwind and digest my trip to Cuba. In the meantime, I wanted to give you a quick taste of some of the highlights of this wonderful, captivating place, a country that stole my heart. 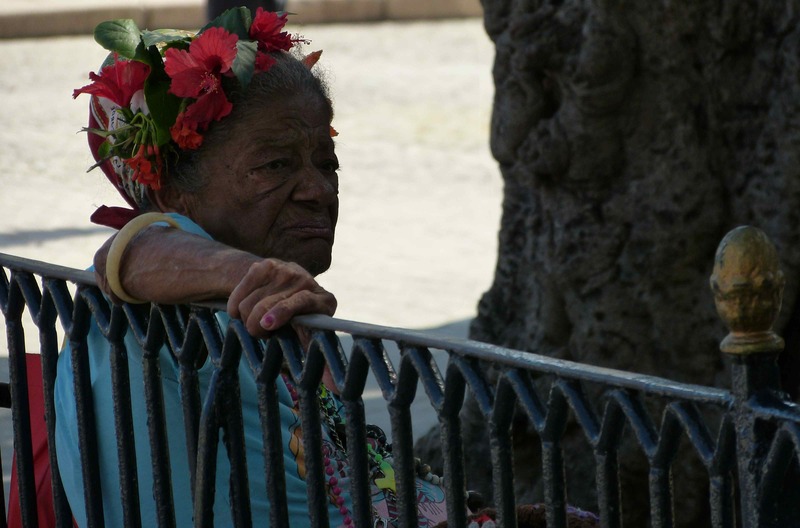 Below are some selected unedited photos to give you a delightful taste of Cuba. 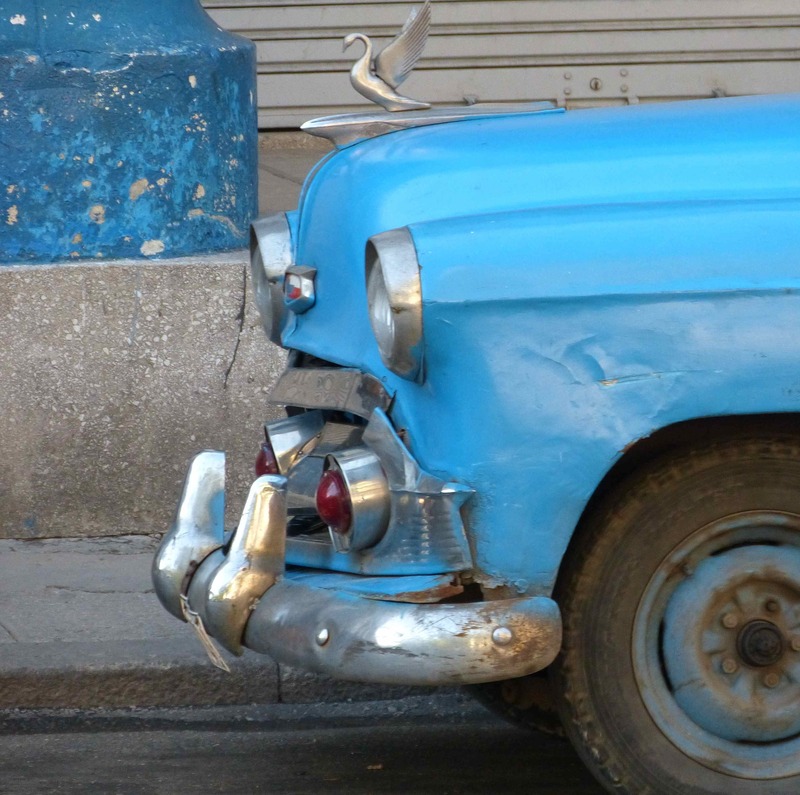 Vintage American cars from the 1950s dot the landscape of Cuba sweeping you back into a different era. 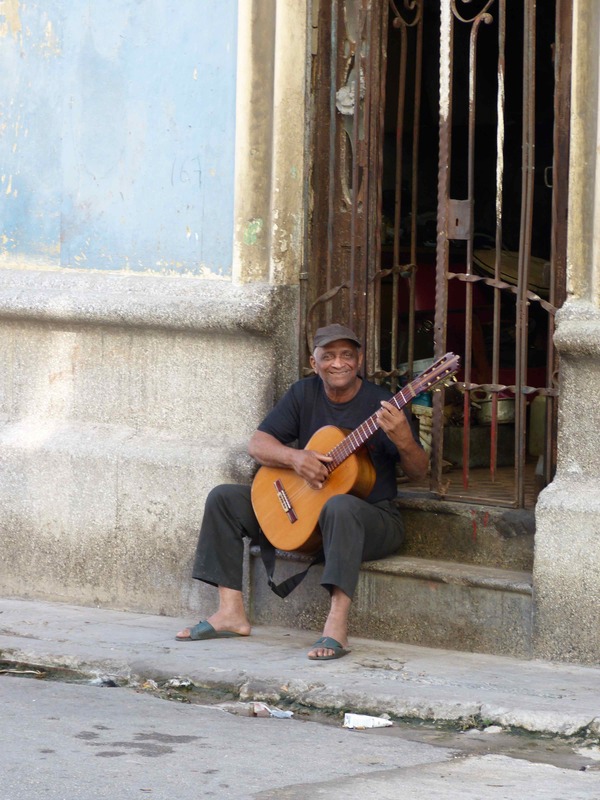 Cubans love their music and street musicians are everywhere. Given the age of the cars, many break down and have to be refurbished with new parts. 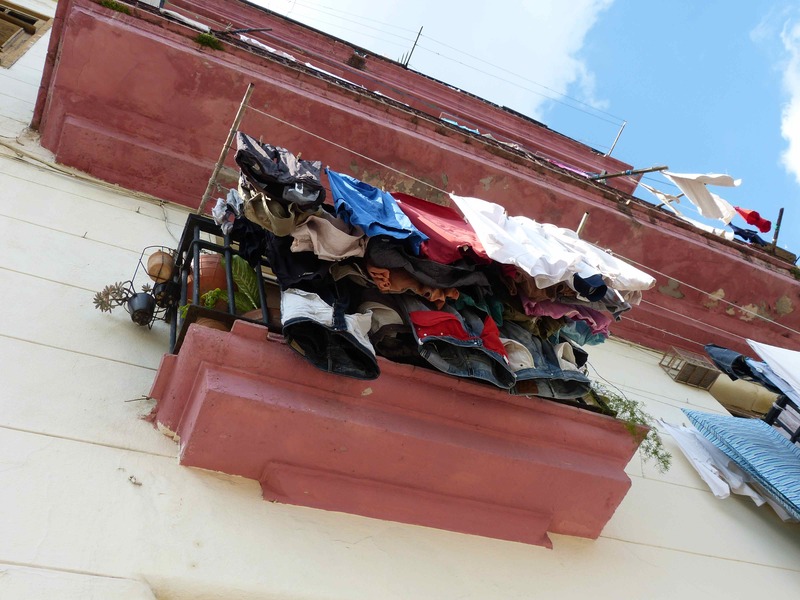 Most Cubans live in small, cramped apartments thus hanging out on the front steps of a building is quite common in Cuba. 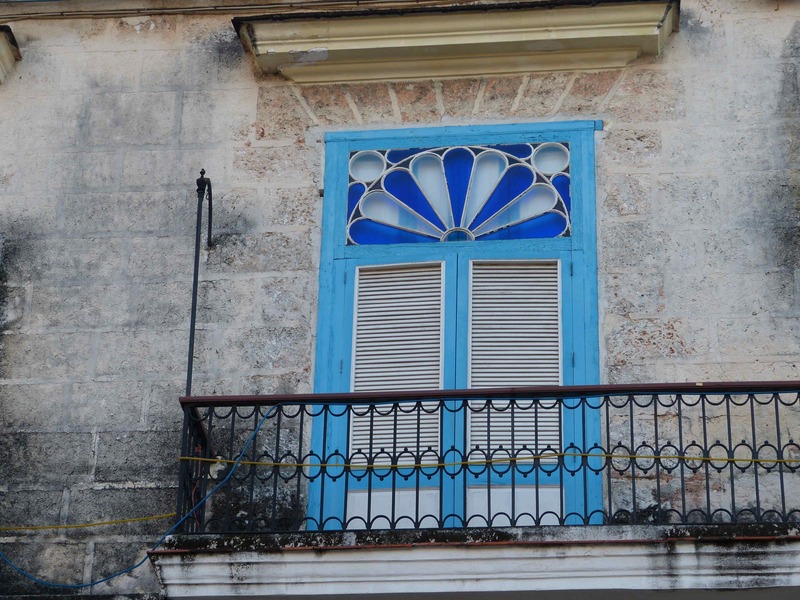 Old Havana is gorgeous and full of beautiful old buildings and Spanish colonial decor. 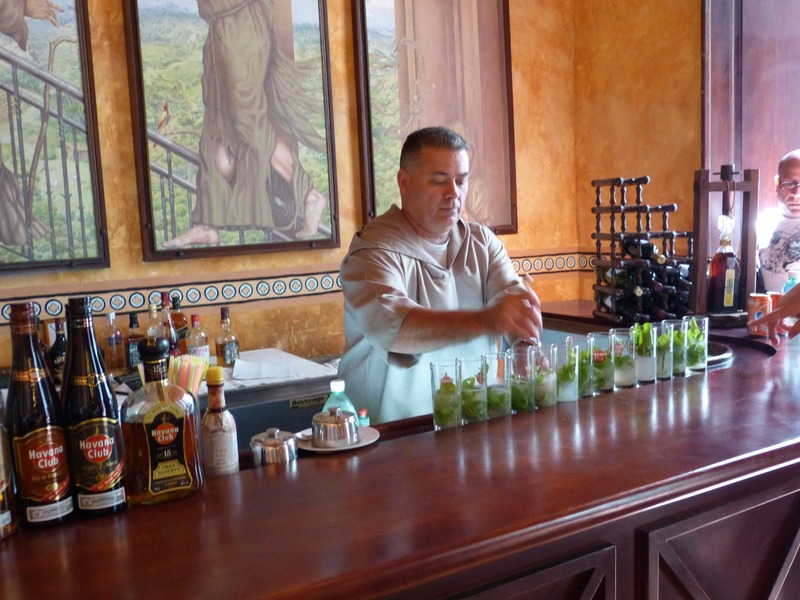 Having a mojito in a gorgeous Cuban bar is a daily necessity. 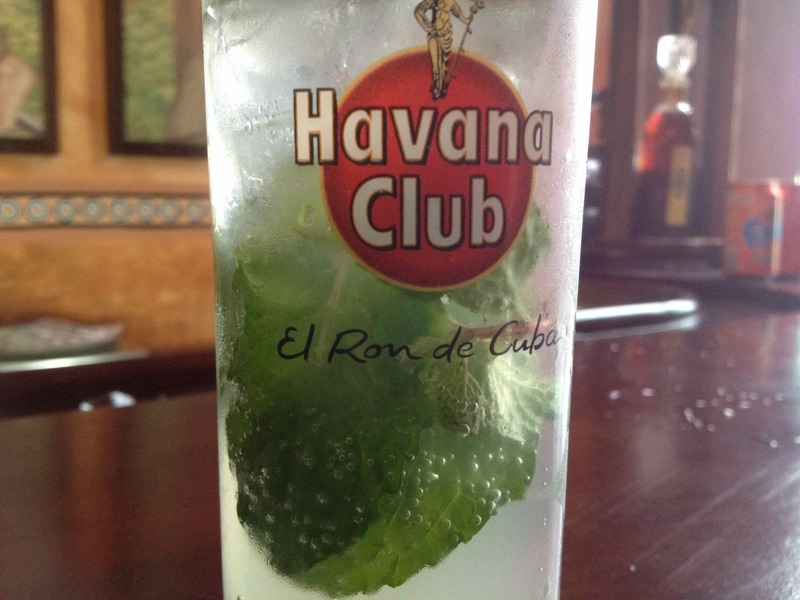 Havana Club is the rum of Cuba and mojitos are the favorite drinks. The perfect example of an authentic Cuban man. 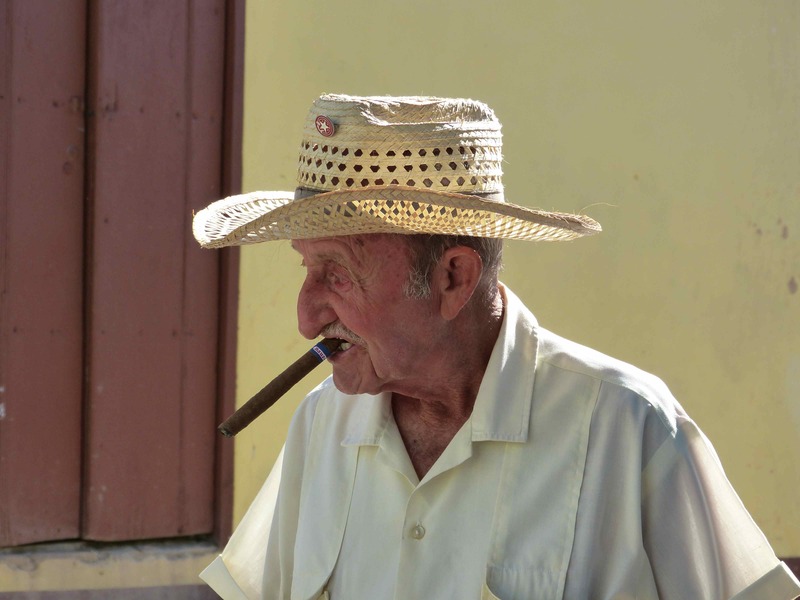 Straw hat and cigar. 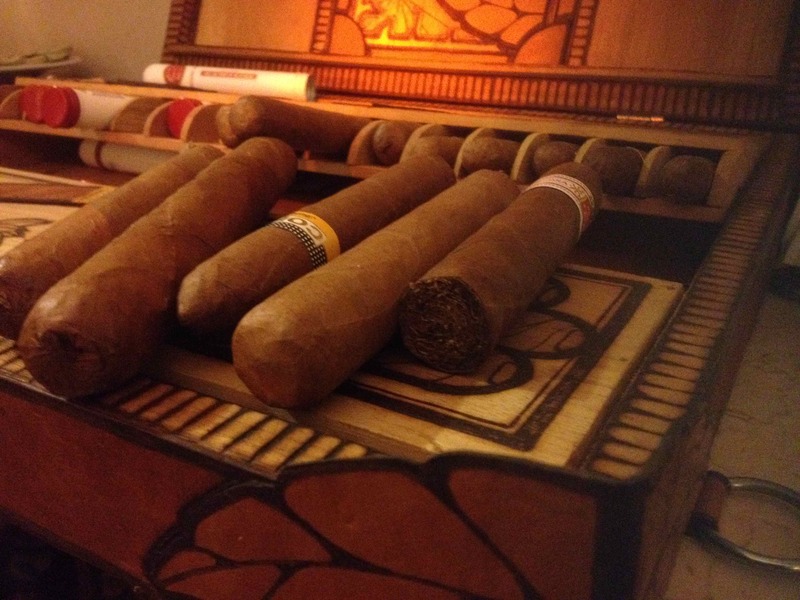 Cuban cigars are everywhere and everyone smokes them. 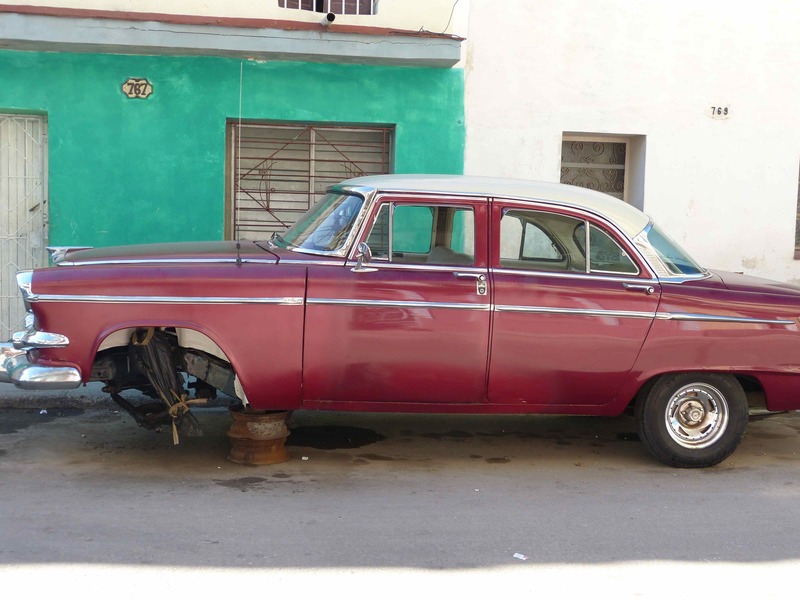 Old American cars from the 50s are the pride and joy of Cubans and a way of life. Many are in various stages of decay and others have been refurbished with new parts. 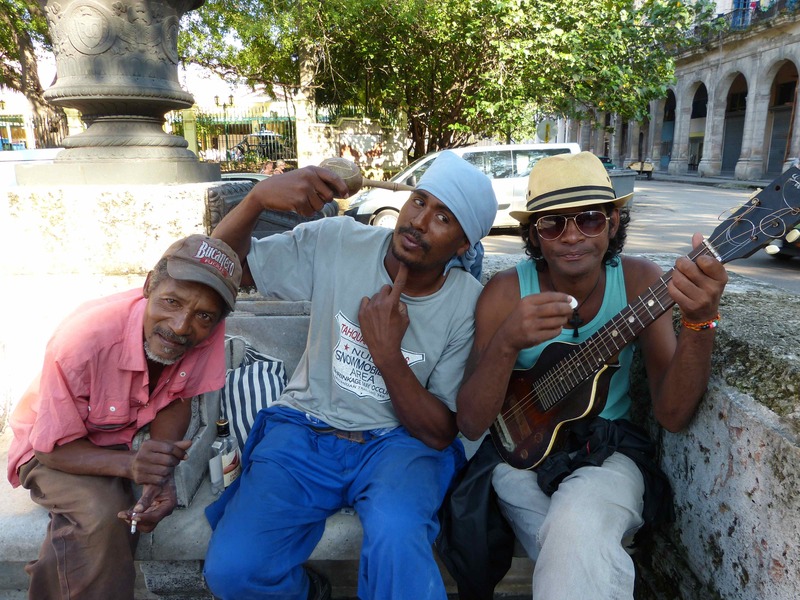 These Cuban men enjoyed serenading me. 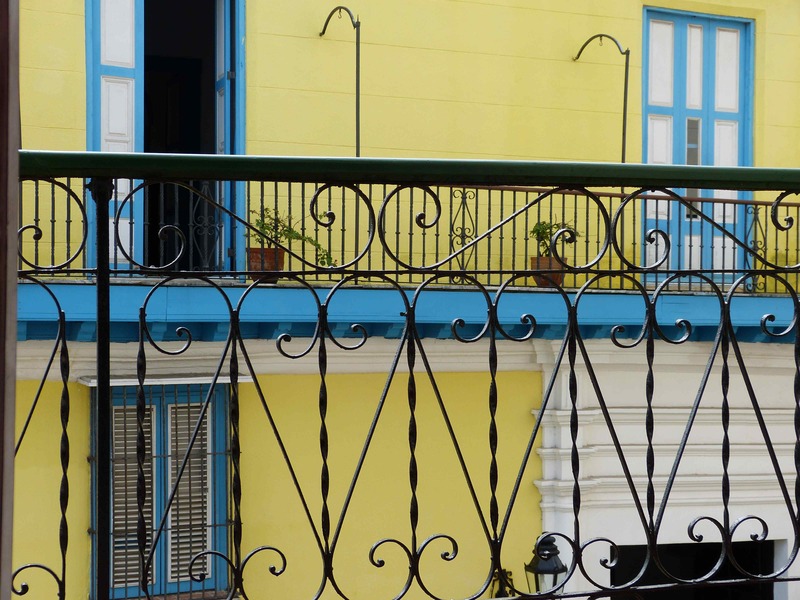 The Spanish Colonial Charm of Old Havana surrounds you. 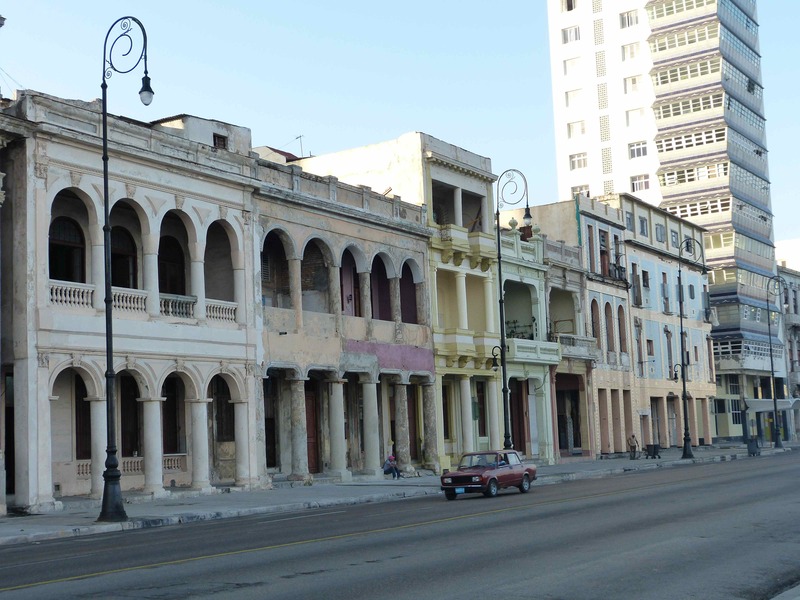 The Malecon, also known as the Cuban’s living room, goes for miles and these once grand mansions and buildings show the effect of time and lack of funds to repair them. Morning fishing boats and fisherman grab their daily catch in Havana. Cuba has one of the highest literacy rates in the world thanks to Fidel Castro. 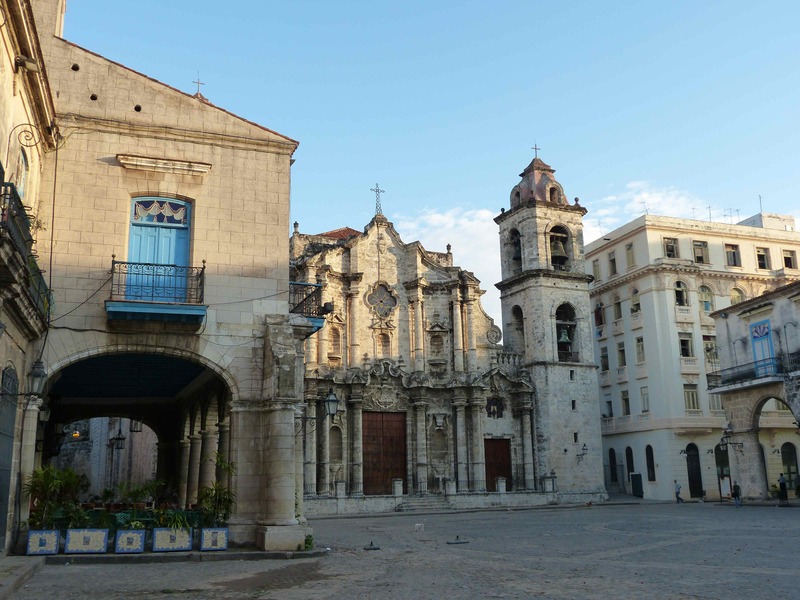 In the early morning hours, you have Old Havana to yourself save the locals. 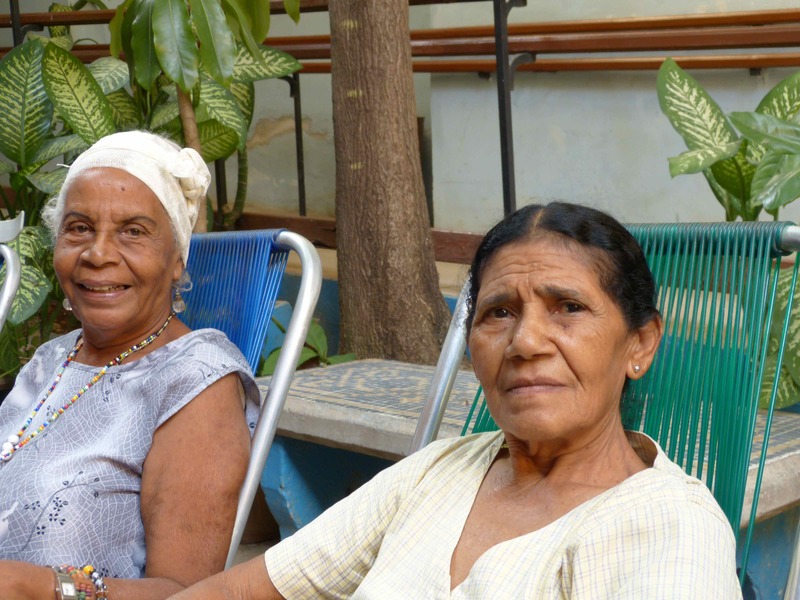 Cuba has a strong Afro-Cuban heritage who take pride in their unique culture. 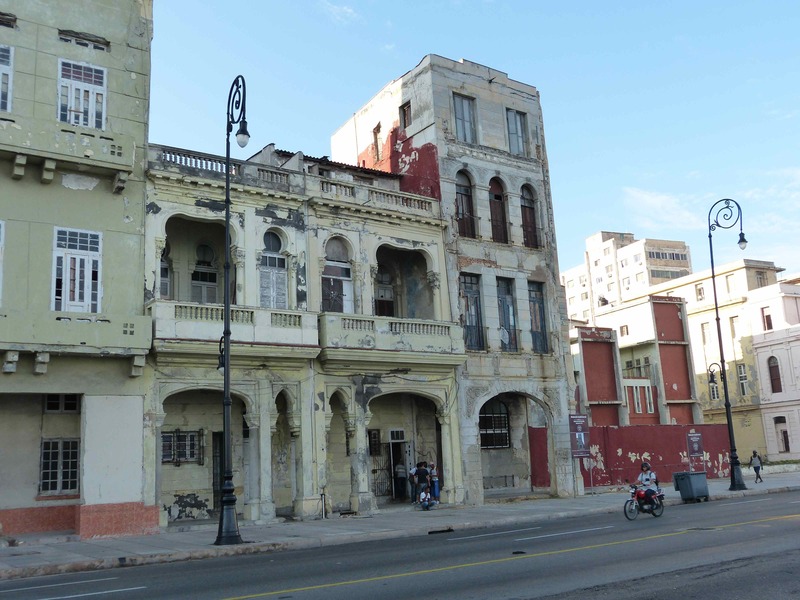 Havana is deteriorating rapidly yet some old mansions and buildings are starting to be restored to their previous grandeur of the 50s and 60s. The oldest American cars that aren’t in great shape are used as “collectivos” or collective taxis for the locals. 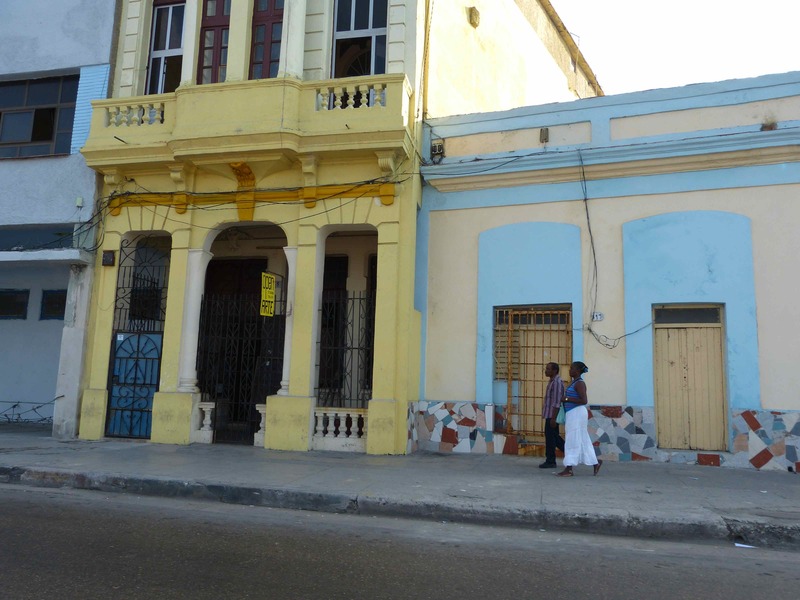 The buildings of Havana are layered in color and history. 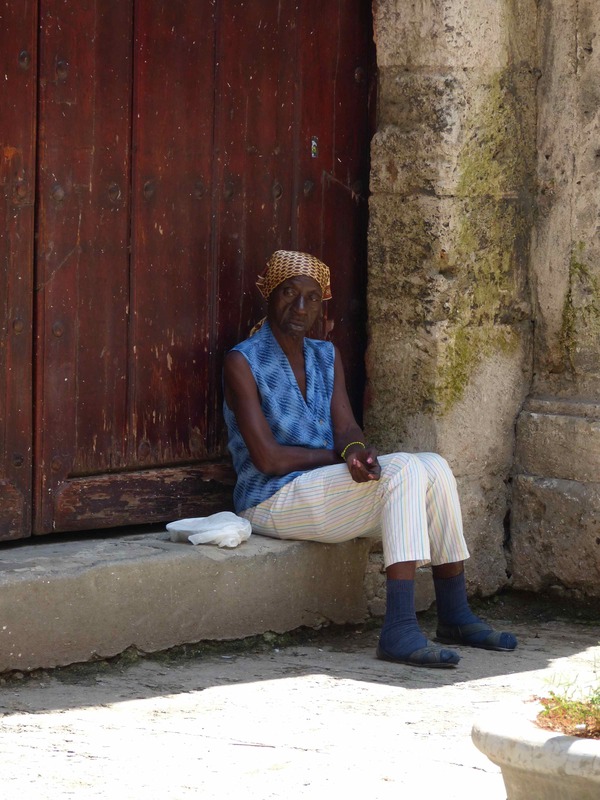 Sadly many are in poor, deteriorating condition yet some are being rejuvenated. 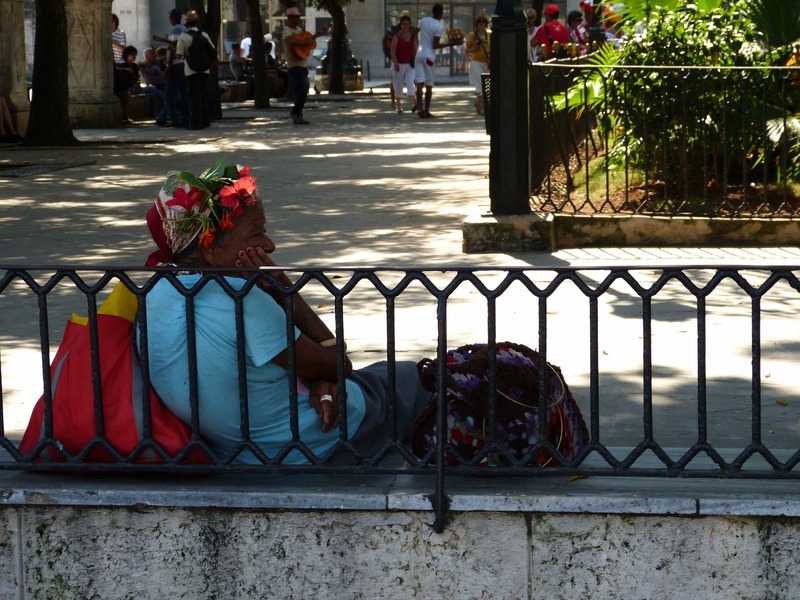 Cuban life is difficult given their living conditions yet Cubans take it all in stride and with lots of laughter. 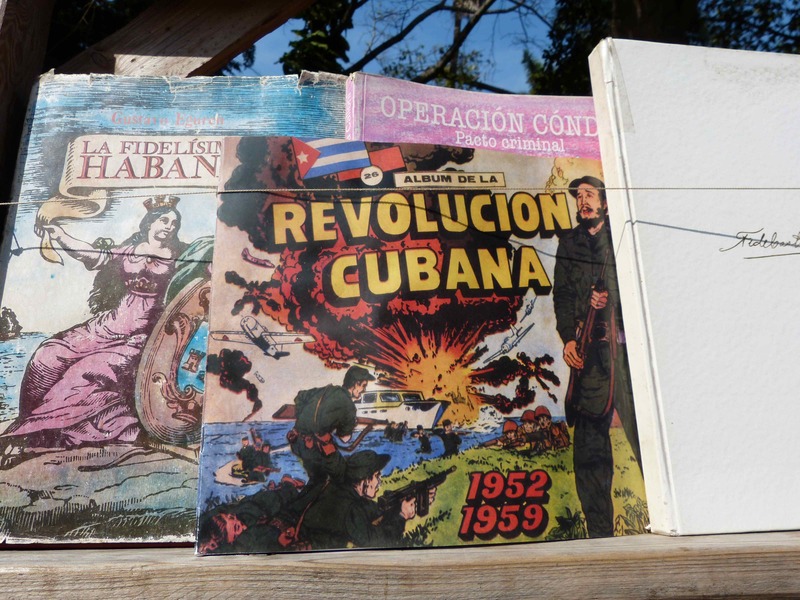 The Cubans love their fiery Revolutionary past. 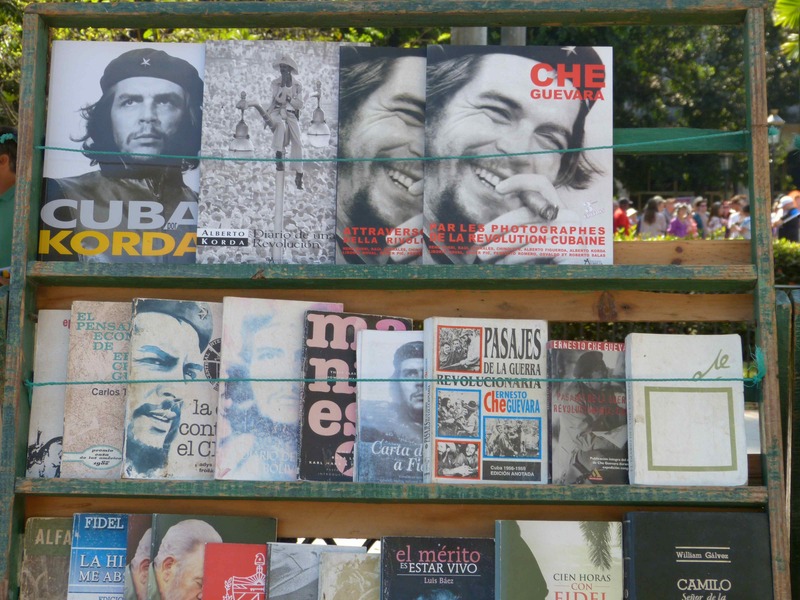 Che and Fidel are on everything ranging from key chains,to posters and old books. Thanks! Many more on the way. Cuba is extremely photogenic! 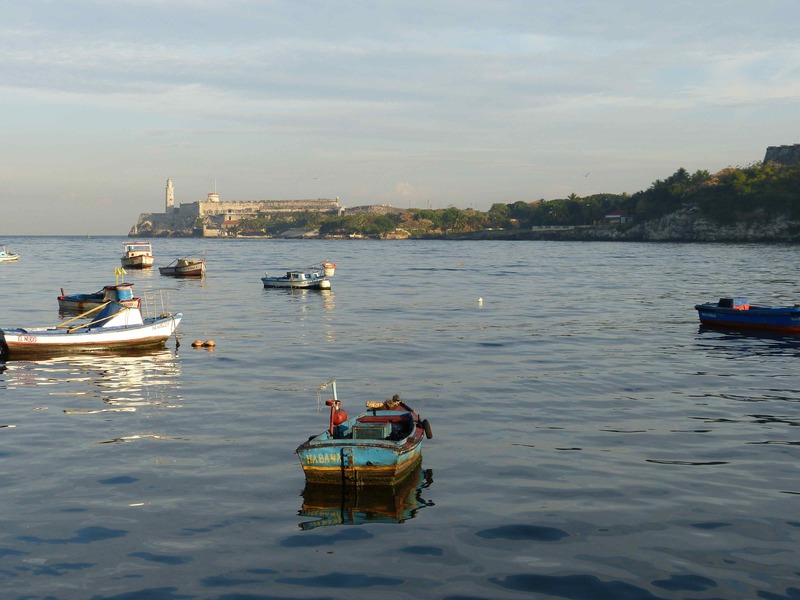 It’s a pleasure to read of your impressions (and see some of your photos) of Cuba, and I look forward to more! Having spent 3 months there last year, I too was inspired to photograph and write a lot (which I’m compiling into a book) and meanwhile offer some specific resources your readers may appreciate at my blog: http://www.InhabitYourDreams.com. Gracias! Wow, GREAT blog! I love your pictures. So great you are compiling a book. If only I was so organized. I loved Cuba so much. It must have been fabulous to have spent three months there. What resources do you provide? I can surely site your blog. Wonderful photos. I look forward to hearing and seeing more. Thanks! I just fell in love with Cuba. It just is such a unique place and I could have spent days taking pictures. All my pics were really rushed given our intense schedule imposed upon us by the US Government. Hope someday we can travel more freely there. These photos are so incredibly stunning, I don’t know where to begin responding. Incredible work, Nicole. Wow! I can’t wait to hear more about your trip to Cuba. It looks like such a fascinating place to visit. It’s great that Americans are getting to go there now as well, it’s been a popular destination from the UK for years and everyone I know who’s been there loves it. Thanks Sas. Yes, it is so annoying all our crazy restrictions and our relations with Cuba and for so long! Good news is there isn’t too many Americans there yet but I don’t like what the blockade has done to the people of Cuba. Not fair. Hopefully Obama will lift it before he leaves office. I would love to visit myself. I have an interesting connection. 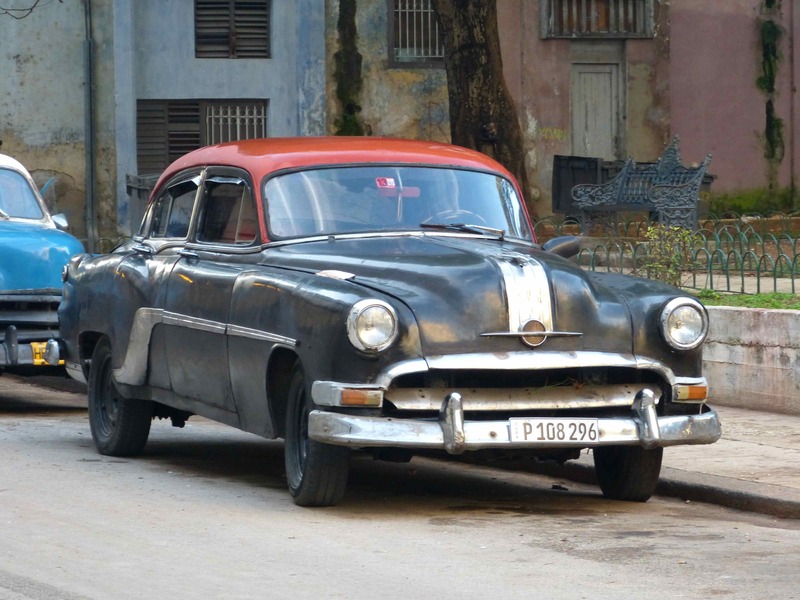 My grandfather was a car salesman who visited Cuba in the 1950’s on business; it’s possible many of the cars still being driven there are ones he sold! Pretty crazy! So amazing! Can’t wait to see and hear more! Thanks Jennifer. I just loved Cuba. It is a place I would love to go back to. I just found it sad that the living conditions are so awful. Cubans don’t get decent food to eat and if they earn pesos their lives are very basic. Yes it is true that they live on little yet I learned a lot during all our meetings and interviews about what their life is like and the changes that are occurring. People don’t go hungry there now and do have one of the highest literacy rates in the world, free education even to the PhD level and free health care. My feelings is that many are frustrated with the slow snails pace of reform yet overall they accept their life as it is and are very happy. 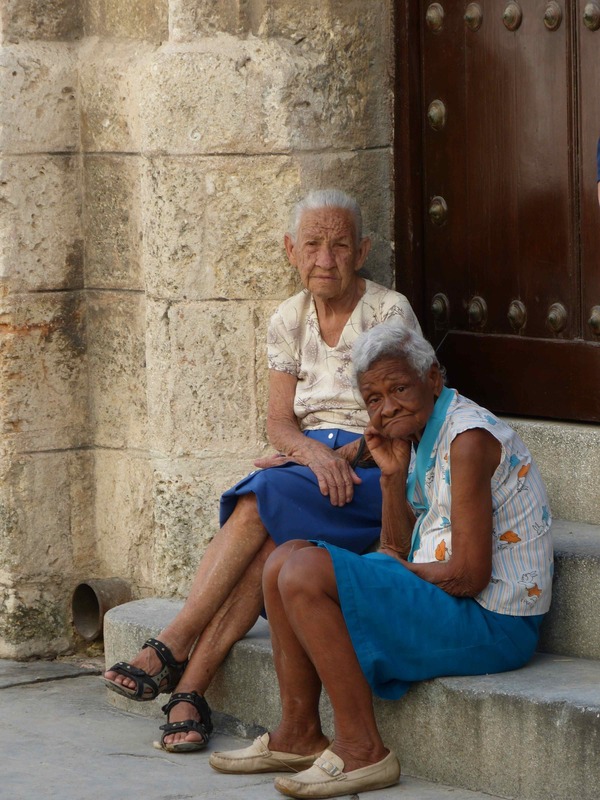 We talked with a lot of Cubans of varying levels and this is the sense I got. Since a few years back the government has allowed private enterprise to enter so now life is very slowly improving. Our embargo has significantly hurt them as well. Indeed their living conditions are tough but no one is without a home and after seeing India I am amazed that even with so little money that the government does provide and take care of their people in a sense. I will dive more into these topics soon and will share what I learned on housing, reform etc. truly interesting. Looking forward to hearing more and being able to visit Cuba through you- I think it would be a fascinating place to visit. It’s so sad to see all the grandeur falling into disrepair- but hopefully they will be able one day to restore it all. Thanks. Yes it is such a fascinating place on so many dimensions. I sincerely hope someday Cuba will be able to pull herself through as she has so much to offer. Reblogged this on CULTURA MUGELLANA E ALTOMUGELLANA. 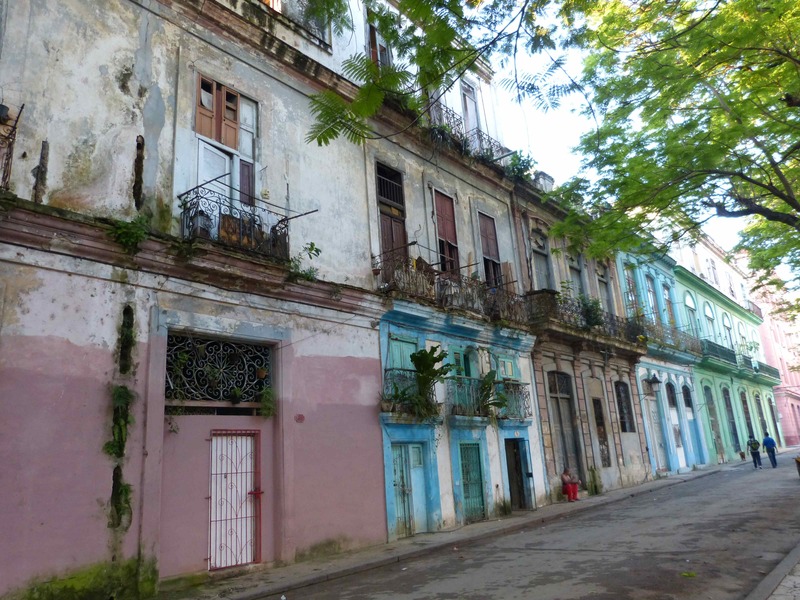 Wonderful images to tell part of Cuba’s story. Thanks Sally! Many more to come! I just returned from Cuba. We may have been in very similar trips andike you I found it to be one that affected me in many levels. I’ve done several posts on the trip and would live to have you take a look. We may even have taken some of the same photos! Enjoyed your take on the experience. Beautiful photos! I can see why Hemingway fell in love with it. Thanks! I just loved Cuba. Such a fascinating place with so many incredibly photo opps! Cuba is fascinating to me. I would love to visit one day. For now, I will live vicariously through you! Thank you for posting! Thank! Yes it is truly amazing! I am so glad I went. I have wanted to for a long time and am glad to have traveled there before it has changed. Fantastic post, Nicole. Your photos are wonderful. Thanks Angeline. One of my favorite places. I loved Cuba. Love these photos, Nicole but I especially love the architecture and vintage cars! My kind of place for photography! Wish I’d been there with you. I can’t wait to hear and see more about your trip! You would have gone absolutely crazy there Lucy. I just LOVED LOVED Havana. I could have seen the two of us out taking pictures all day long. I took about 1400 and they were all sadly on the fly. Too busy to really focus on the photos but some turned out well. 🙂 Stay tuned! Your photos look amazing, Nicole! And yes, I wish I’d been there with you. Your compulsory meetings with the locals sounds really informative too. I bet you learnt much more than if you’d gone independently. I will go to Cuba some time for sure & will ask you for recommendations! Did I tell you I’m thinking about returning to Latin America? Maybe Antigua but not decided on that yet. Nicole, I’m really looking forward to hearing more about your trip and seeing more photos! I think it must’ve been an incredible experience! I feel Latin America is where I want to be now and Antigua is the obvious place to return to. Maybe I’ll stay there or if not, then somewhere else in Latin America. Of course, it would be wonderful if you could visit some time!!!! Thanks! I just loved it there. So amazing. More soon! Nicole, I am looking forward to your stories from Cuba. Your photos of the people are incredible. They need no words to accompany them. You’ve captured the essence of Cuba! I’m curious about the photo where the three musicians are playing. Were they singing a song about revolution? It looks like the guy in the middle is miming gun shots to the head. Thanks so much. I truly loved loved loved Havana. So fascinating! Yes, you are right! They were singing about revolutions however they were also half in the bag. 🙂 More soon! Gorgeous photos. Can’t wait to read more about your time in Cub! Thank you! More coming soon! Dream trip. Would love to experience el ritmo with Afrocubanos! Can’t wait to read more. Glad you got the chance to finally get to Cuba. It is an amazing place isn’t it? We do too. My brother and girlfriend went for the first time and he loved it too. I am particularly interested in these posts Nicole and hope someday to take the trip we had planned to Cuba a few years back. I have always heard it is like stepping back into the 1950’s. Thanks LuAnn! 🙂 More coming soon! Yes, it is like the movie “Midnight in Paris” in a sense. The old cars pull up and you step back in time. AMazing! Great pictures. Made me remember many things about my city. A photographer with a great eye. I loved Havana. What an amazing amazing city. I loved the culture, the music and the people. So beautiful.